The 1998 G3 tour hit Europe and very little information was archived from this tour. 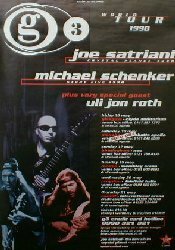 In addition to G3-ers Michael Schenker and Uli Jon Roth, there were special appearances from Brian May (in London) and Patrick Rondat (in France). 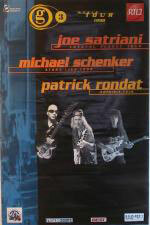 Joe Satriani's band included Stu Hamm on bass and Jeff Campitelli on drums. Michael Schenker's band included Seth Bernstein on guitar and keyboards, Shane Gaalaas on drums, Jeff Kollman on bass and two vocalists - David Van Landing and Gary Barden. Uli Jon Roth's band included Liz Vandall on vocals, Clive Bunker on drums, Don Airey on keyboards and Francois Garny on bass. There are some photos of Uli Jon Roth from the G3 dates available here. If you have any information you'd like to contribute, please contact webmaster@satriani.com.